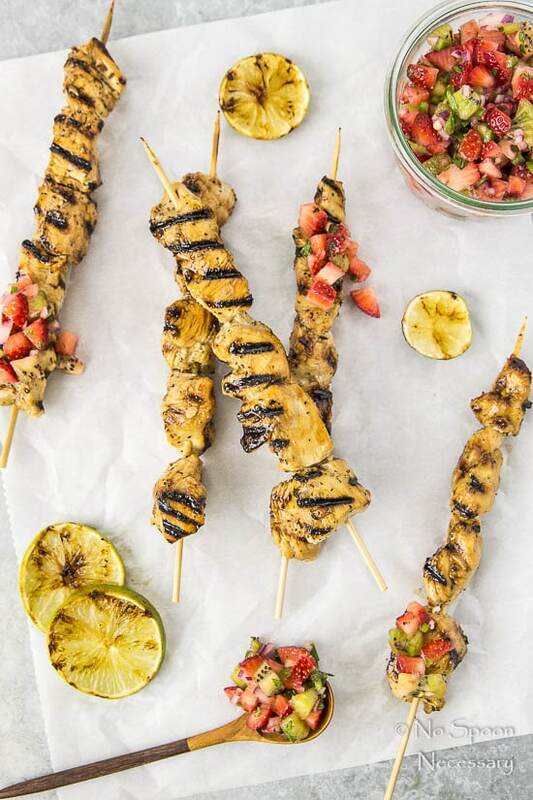 Tender, sticky balsamic honey chicken skewers with fruity, sweet strawberry, kiwi and jalapeno salsa. 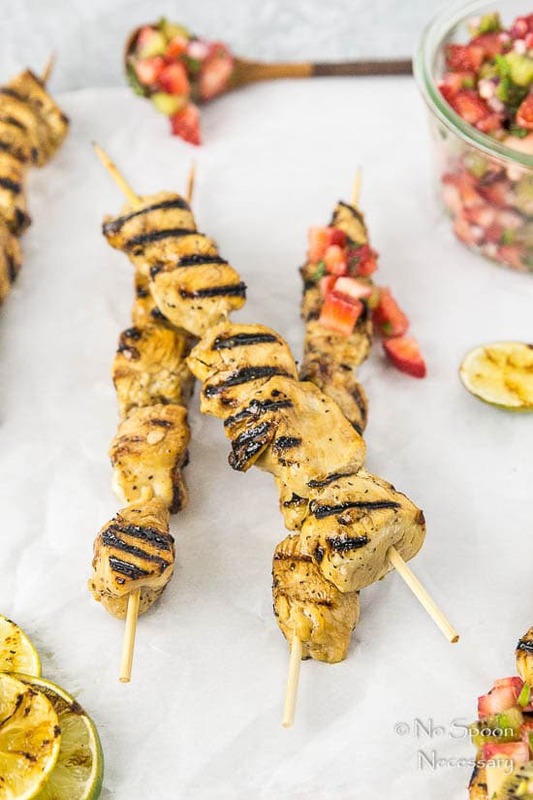 These sensational skewers are a perfect for Memorial Day weekend or any summer grill out! 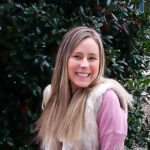 Hi-ya friends! Happy hump day! How has the week been treating you? Hopefully it has been well, but in case it hasn’t, have no fear. A long, extended holiday weekend is near! Woot Woot! Can you guys believe it’s almost Memorial Day weekend already? I know I can’t. Last year seemed to go by so fast, but it seems like this year is going even quicker. To me memorial weekend is the unofficial start of summer. I know the first day of summer isn’t officially until June 20th. But, the upcoming weekend to me signalizes the go ahead to lazily lounge in the sun, sip tropical cocktails, add fruit to every meal and grill all the things humanly possible. Memorial weekend also means paaaaartay! To help you with the grub part of your holiday weekend a bunch of (<- over 50) fabulous food bloggers and myself have gotten together to bring you some fantastic dishes absolutely perfect for this weekend. 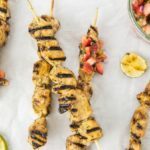 Since I have been all about the grill and fresh fruit recently, I decided to contribute some seriously scrumptious Balsamic Honey Chicken Skewers that combine two of my favorite summer things to the Virtual Memorial Day Party. 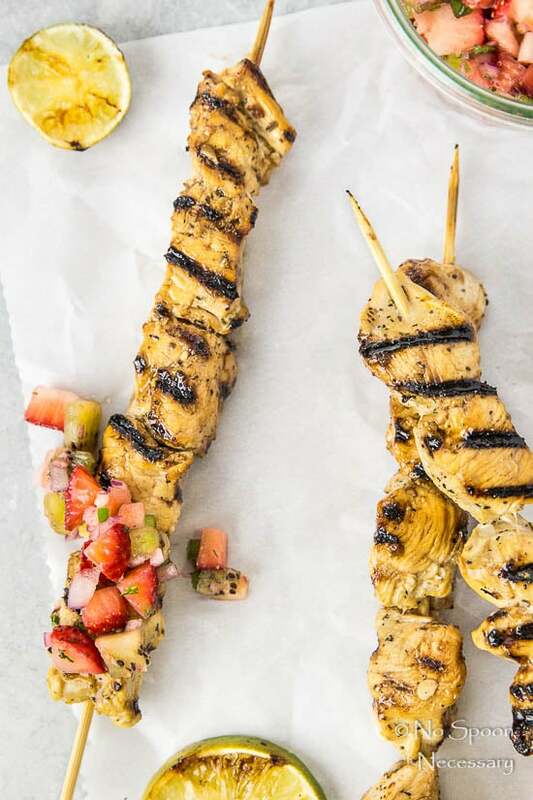 These sensational skewers are a delicious combination of sweet and savory, which is everything my feed-me-summer-Seymour self is currently craving. 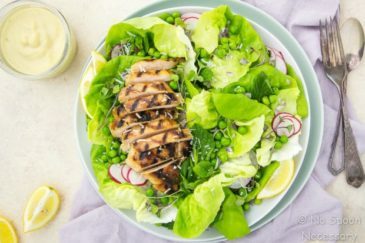 The balsamic honey coated chicken is tender, sticky, and slightly sweet with notes of smooth, tart balsamic vinegar and smoky char from the grill. 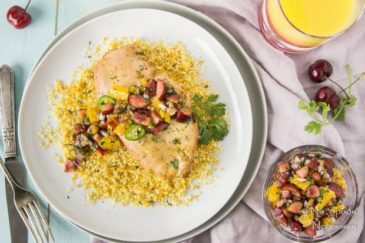 The accompanying strawberry, kiwi and jalapeno salsa is refreshing, fruity and sweet with a touch of jalapeno spice and pops of minty freshness. 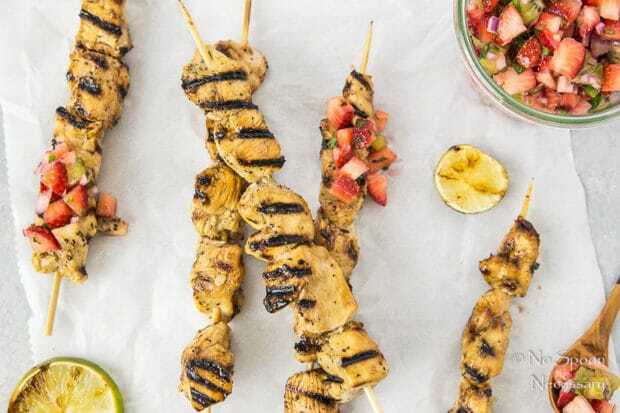 The salsa is unbelievably delicious on its own, or scooped up with salty chips, but it is out of this world delicious when piled high on the savory chicken skewers. Succulent, bite sized pieces of chicken on a stick + heavenly fresh and sweet salsa = epic summertime eats. I cut my chicken breast into approximately 1’’ cubes. You can go bigger or smaller depending on your preference, just be sure to adjust your cooking time accordingly. The salsa is highly customizable. I left the seeds and ribs in my jalapeno, because I like a bit of spicy heat. If you want a mild salsa, be sure to de-seed and remove the ribs from your jalapeno. If you want a super sweet salsa, add honey to taste. If you like kiwis more than strawberries, use 3 instead of 2 as directed. Do you friends, and adjust the salsa to your liking. 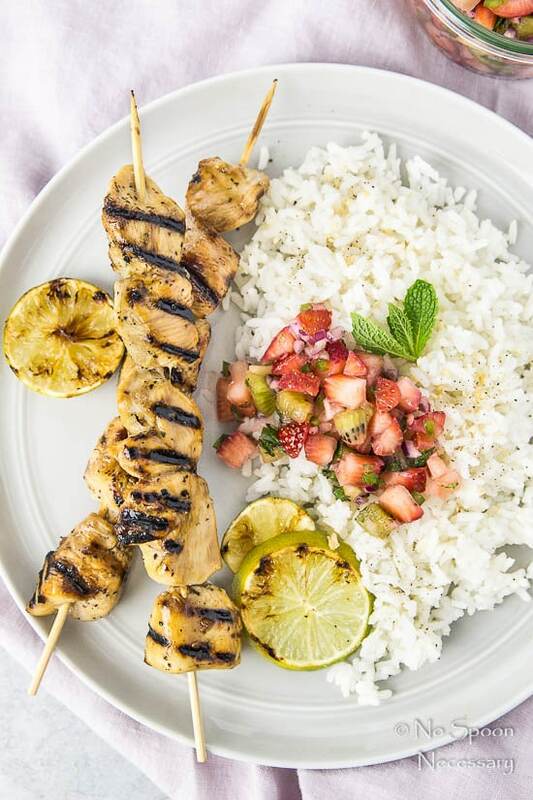 If you are using wooden skewers for your chicken, always make sure you soak them in water for at least 30 minutes to prevent burning. There is nothing worse than your skewers burning apart and your chunks of chicken going rouge on the grill. 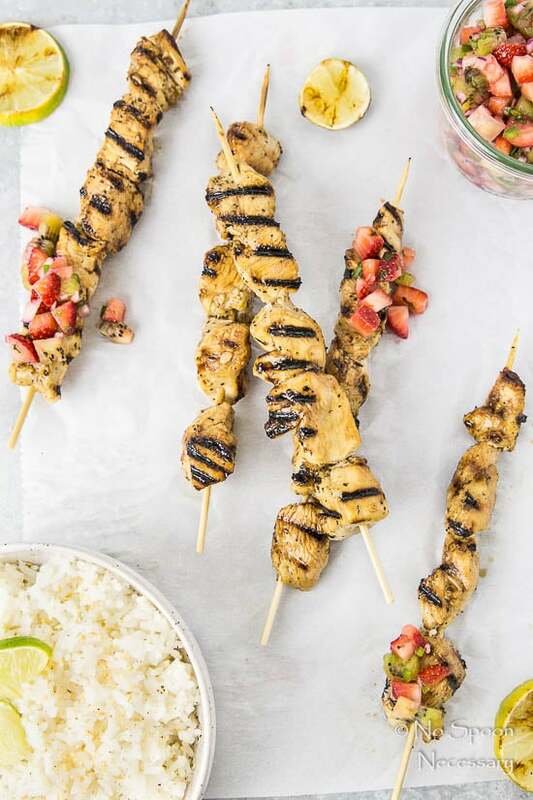 Sweet, savory and perfect for summer, these Balsamic Honey Chicken Skewers with strawberry-kiwi salsa belong on your Memorial Day weekend menu. 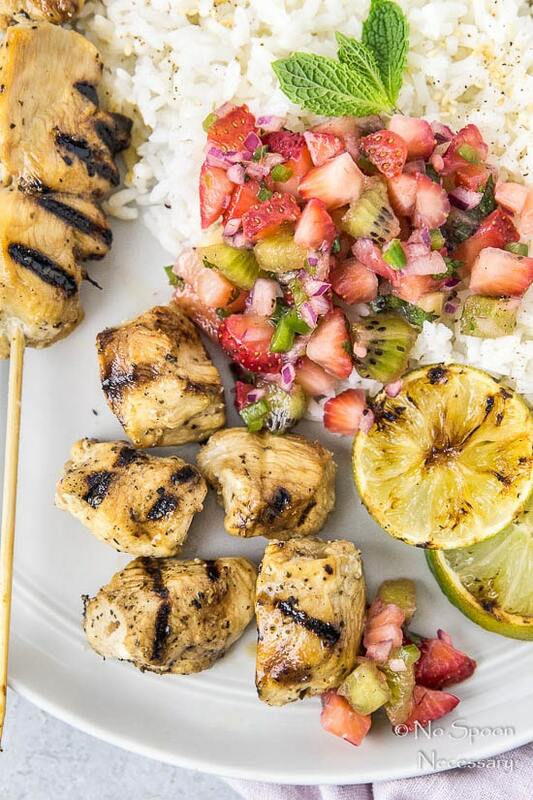 Until next week friends, Cheers – to a holiday weekend filled with magically delicious grilled eats… and plenty of R & R.
Tender, sticky balsamic and honey coated chicken skewers with fruity, sweet strawberry, kiwi and jalapeno salsa. 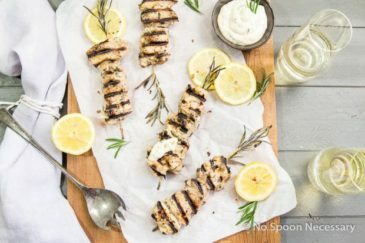 These sensational skewers are a perfect for Memorial Day weekend or any summer grill out! Marinate the Chicken: In a medium bowl whisk together the balsamic, 2 tablespoons of honey, garlic, basil and olive oil. Season with a pinch of salt and pepper. Transfer to a large Ziplock bag and add in the chicken. Seal and refrigerate for at least 1 hour, up to overnight, turning occasionally to make sure the chicken is evenly marinating. 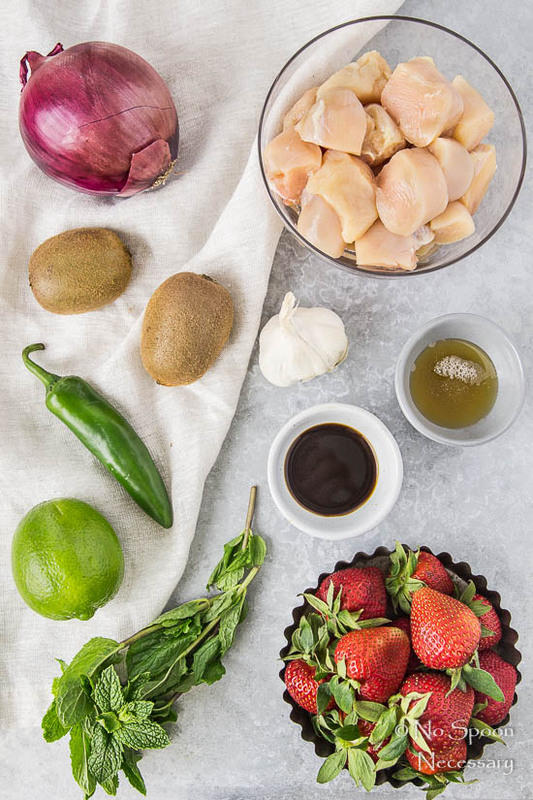 Prepare the Salsa: In a small bowl, gently combine all ingredients together. Taste and adjust for seasoning. Set aside in the refrigerator until ready to use. 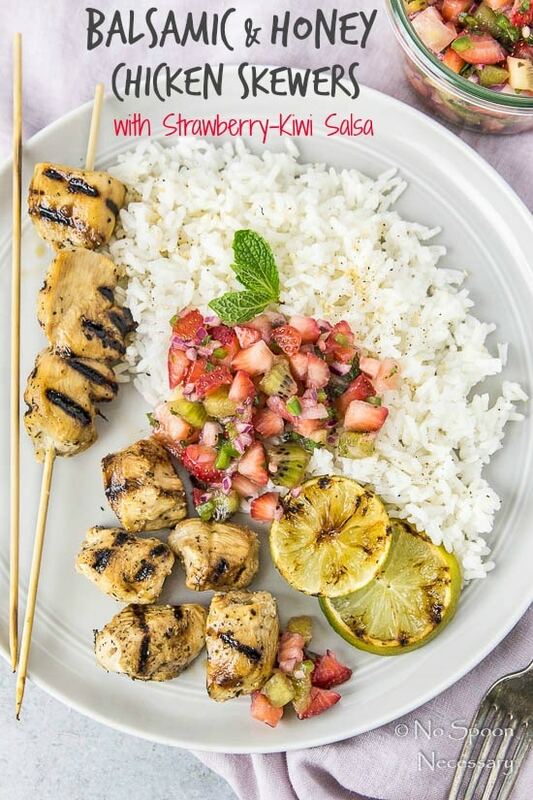 Preheat Grill to Medium-High: Thread the chicken onto skewers and set aside on a clean plate. Season with salt and pepper. Spray grates of grill with non-stick cooking spray. Cook the chicken, turning every 3-5 minutes, for a total of 8-10 minutes or until chicken is cooked through (to an internal temperature of 165 degrees F). Remove from grill and transfer to a clean work surface. Brush chicken with remaining 1 tablespoon of honey. Allow to rest for 2 minutes. *For a milder salsa remove ribs and seeds from jalapeno before mincing. *Salsa is best on the day it is prepared. 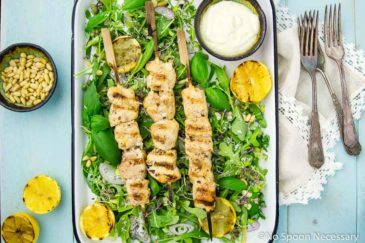 *If using wooden skewers, be sure to place them in a shallow pan and cover them with water for at least 30 minutes to prevent burning.